A registered pharmacist among 3 arrested for manufacturing drugs - SABC News - Breaking news, special reports, world, business, sport coverage of all South African current events. Africa's news leader. Police say one of the three people arrested at an illegal drug manufacturing laboratory in Hammanskraal outside Pretoria is a registered pharmacist. This emerged during National Police Commissioner Khehla Sithole’s visit to the crime scene earlier today. On Wednesday, police arrested three people on a drug manufacturing spot on a plot following a tip-off. 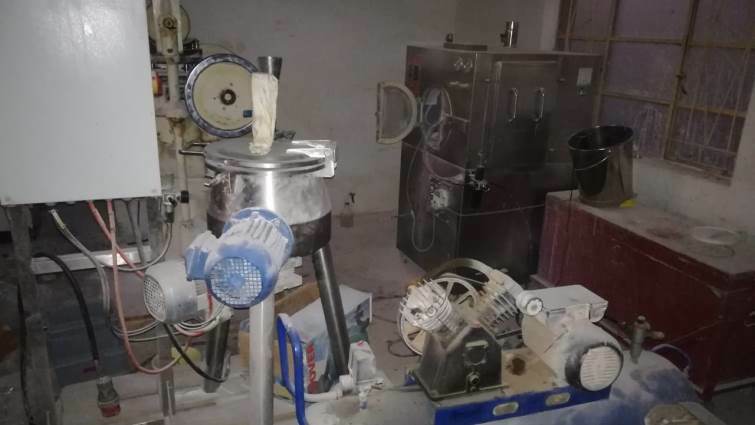 They seized drugs worth millions of rands, sophisticated manufacturing machines, plastics and buckets used to make drugs. The Tshwane K9, following a tip-off, arrested a registered pharmacist, his wife and an employee. They were arrested for illegally manufacturing schedule six substances. Police also recovered three unlicensed firearms and ammunition, two pistols and a shotgun. Operations have been going on unnoticed for almost eight years. But on Wednesday, police pounced on the couple and their employee while they were manufacturing drugs. Drugs and equipment worth millions as well as bags of chemical powder were uncovered. The area has been declared a crime scene and is now under the custody of the state. But the products are already being sold to the public. “We will be following where was the stuff going – where is the distribution as we speak and we’re also fortunate some of the stuff the chemicals and other raw material brought here will be able to trace from the boxes that they were brought in here with – soon we will be able to establish where is the stuff – where it has been sold but the investigation continues,” says Sitole. Sitole says they’re also hot on the heels of the co-ordinated supplier. He was sentenced to 15 years in prison in 2017 in another case. But it was commuted to a R900 000 fine. Meanwhile, the suspects, aged 38, 50 and 52 are expected to appear in court soon. They’ll face charges of being in possession of unlicensed firearms and ammunition as well as manufacturing of drugs. This entry was posted on 21 Mar 2019,05:33PM at 5:33 PM and is filed under South Africa, News, Homepage Latest Stories Slider, Homepage Featured Story Slider. You can follow any responses to this entry through the RSS 2.0 feed. Both comments and pings are currently closed.